On Episode 31, Professor Penny Fielding of Edinburgh University (and organiser of Edinburgh spy week) told Spybrary listeners that she felt the spy novel with the most convincing female characters is Restless by William Boyd. Spybrary podcast listener Clarissa Aykroyd has some well documented issues on the portrayal females in spy books. She loves the work of John le Carre and admits that even his female characters are pretty thin. So she sought out Restless and very kindly brush pass reviewed the novel for us. We have extracted the transmission from the disk that came in the Spybrary diplomatic bag and decoded for you. Just click the play button or listen on these various platforms. What did Clarissa think of Restless? What did Clarissa think of the female characters? Was Professor Fielding right to claim William Boyd’s novel is the best spy book when it comes to female characters? Listen in and find out. 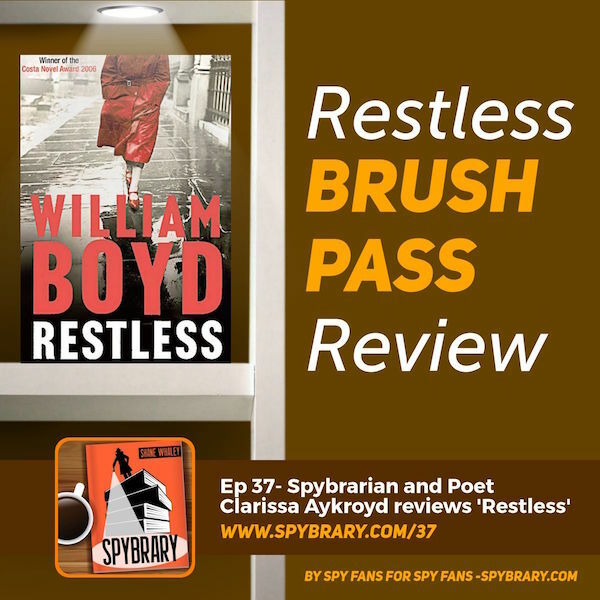 So what is William Boyd’s Restless all about? ‘It is Paris, 1939. Twenty-eight year old Eva Delectorskaya is at the funeral of her beloved younger brother. Standing among her family and friends she notices a stranger. Lucas Romer is a patrician looking Englishman with a secretive air and a persuasive manner. He also has a mysterious connection to Kolia, Eva’s murdered brother. Romer recruits Eva and soon she is traveling to Scotland to be trained as a spy and work for his underground network. After a successful covert operation in Belgium, she is sent to New York City, where she is involved in manipulating the press in order to shift American public sentiment toward getting involved in WWII. If you want to send in a brush pass review, record it on your smartphone and email to shane@spybrary.com We will do the rest. 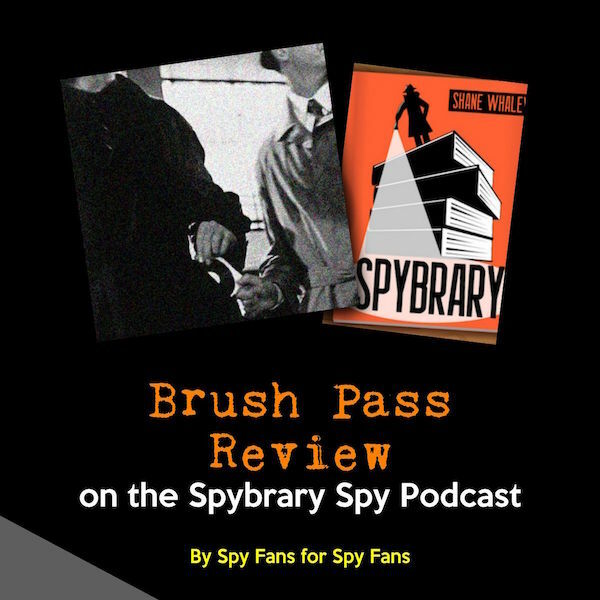 If your brush pass episode is aired then you will receive a $20 Amazon voucher as a thank you from us all at Spybrary! Fortunately I’ve read ‘Restless’ because this review should certainly come with a spoiler alert ! That said, Clarissa is correct, Boyd is a fine writer and he does draw good female characters. He has written another novels that include espionage – notably ‘Waiting For Sunrise’, ‘Ordinary Thunderstorms ‘ and the fabulous ‘Any Human Heart’ and my hopes were very high when it was announced he was to do a Bond novel. Unfortunately my confidence was misplaced because ‘Solo’ turned out to be quite dire. I agree with Clarissa that Le Carre’s female characters are a little thin but there are other spy writers who do an excellent job portraying women. Mick Herron, Joseph Karon and Alan Furst to name but three. Also, I think that Deighton did an excellent job portraying women in his Sampson books. Fiona, Gloria and Lisl Hennig are far from being cardboard cut outs. When it comes to the fantasy spy category, O’Donnell did a brilliant job portraying Blaise and probably, the biggest surprise of all was Fleming, when he did a complete volt-face and wrote so brilliantly in the first person as Vivienne Mitchel in ‘The Spy Who Loved Me’. So, there are great female characters in Spy books but when it comes to espionage, for better or for worse, it was a male dominated world and we can’t re-write history to increase their share of voice or change the fact that Mata Hari was an exotic dancer.